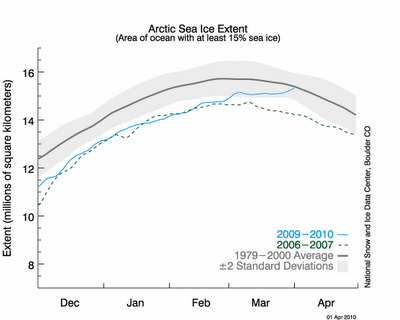 Arctic Sea Ice extent is peaking very late this year. Why? If the world is so warm, how can this be? Yes the extent has peaked up, mostly driven by increases in the Bering Sea related to winds pushing the ice out in that region and also cold temperatures. Elsewhere in the Arctic it has been unseasonably warm. Although the winter ice extent is now around normal, I wouldn't make too much of it. The trends in the winter ice cover have been small and we would expect them to be because temperatures in winter will still be cold enough for a long time to come to form ice. The main issue that should be looked at (which the extent doesn't show), is how thick the ice is. We know this year we have even less of the oldest and thickest ice than we've had during the satellite data record, so the overall 'volume' of the Arctic ice pack is still likely anomalously low. Places like the Bering Sea are seasonally ice covered and melt out every summer, so more ice there than normal this winter doesn't have much impact on the summer ice cover. So, once again we need to emphasize that "extent" is not "volume," and it's the latter that is really important, and that global conditions are not local conditions. Dr Stroeve says they will be writing about this in their April 6th update. Is This the Story of Your Life, or What? Why No Drilling off the Pacific Northwest Coast?